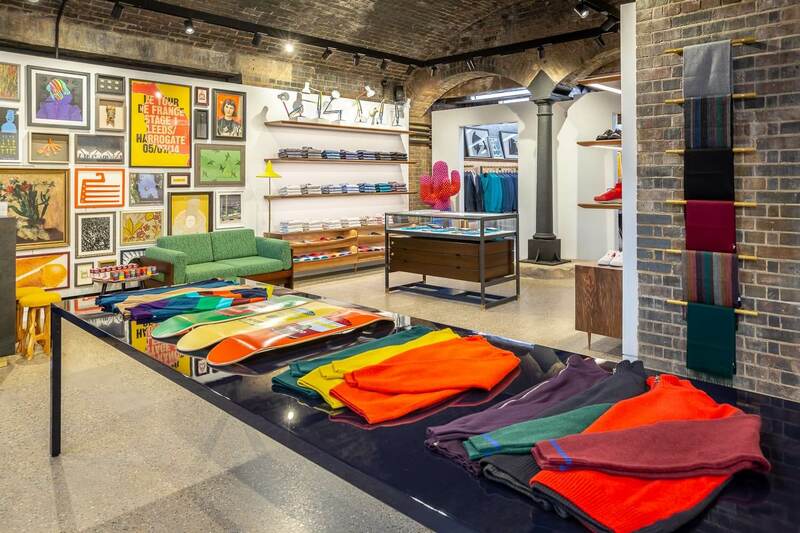 BCP table project with Paul Smith Ltd: Our bespoke composite panel division were delighted to be asked to make two tables for Paul Smith’s new flagship store in an exclusive new shopping district near Kings Cross, Coal Drops Yard. This regenerated area, opened in October 2018 is the site of the 19th century coal warehouses, which were built to store and transfer coal by rail from the north of England across London. Once the marshalling yards of the industrial revolution, Coal Drops Yard is now home to 9,290 square metres of shops and restaurants, housed in the sensitively restored Victorian brick arches. Sir Paul Smith is an iconic British designer, renown for his creativity and use of fine fabrics, mixing traditional formal wear with modern high fashion. His collections of clothing and accessories are characterised by their inventive use of traditional craftsmanship. This British company founded in Nottingham in 1970 has expanded into over 70 countries. Paul Smith’s original guiding principle of ‘classic with a twist’ remains as the company’s core value. Each Paul Smith design is underpinned by a dry British sense of humour: quirky but not frivolous, eccentric but not silly. This project presented an engineering challenge due to the length of the tables required and the customer’s requirement for minimal visual support. The BCP team worked closely with the Paul Smith team to design and manufacture a three metre and a four and a half metre long table, which were both one metre wide. This was achieved due to the high strength but low weight properties of the aluminium honeycomb core and aluminium alloy skins.The finished tables are strong enough to hold Paul Smith’s signature clothing and accessories, and during the shop opening they were used as a catwalk for the models! Before they were fitted into the store they were painted in the Paul Smith colours by BCP’s partner company based in Milton Keynes, SCC Coatings, who are also involved in painting trains – very appropriate knowing the history of the store’s location! The Paul Smith team were thrilled with the outcome, and the tables are a key feature in the Coal Drops Yard store.